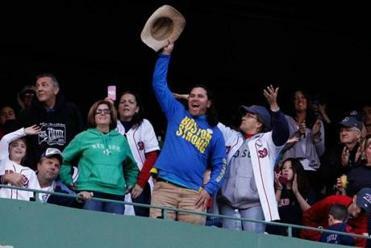 Carlos Arredondo, easily recognizable with his cowboy hat, has done so much to comfort others. Sometimes, though, the comforters need comforted, too. Boston Athletic Association head Tom Grilk was in Maryland last week, telling a conference on risk and crisis management how the BAA handled the Boston Marathon bombings when a stranger approached after his talk. It was a former Marine named Dave Smith who lives in Norway and had spoken at the conference about reintegrating after combat. “Do you know Carlos?” Smith asked Grilk. Everybody knows Carlos. Carlos Arredondo is the guy in the cowboy hat, the guy who ran toward the explosions at the finish line of the 2013 Boston Marathon when every human instinct told him to run the other way. He pulled down barriers so emergency workers could get to the wounded. The photo of him helping a badly injured Jeff Bauman is iconic, capturing the selflessness of so many ordinary people on that extraordinary day. But long before he was a hero, Carlos Arredondo was a father of a Marine, a lance corporal named Alex Arredondo who in 2004 was shot and killed in Iraq. He was 20 years old. 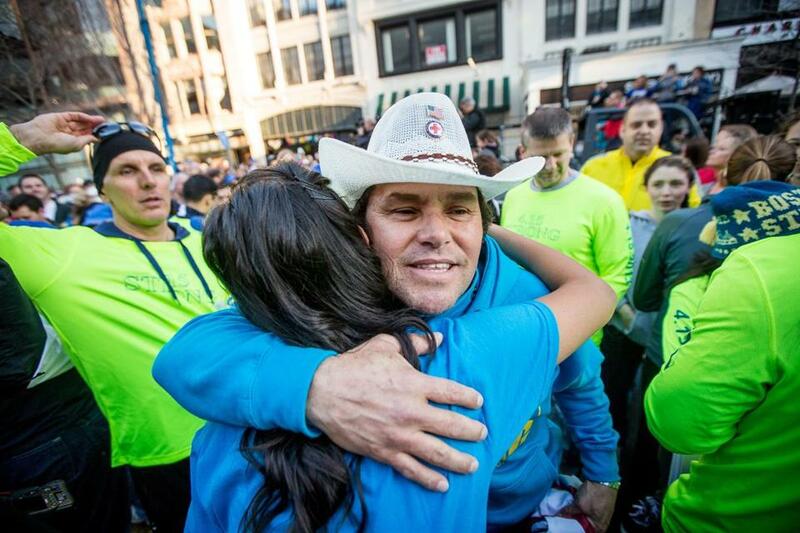 Carlos Arredondo leapt into the fray on Marathon Day, and hasn’t stopped since. Dave Smith, a Marine infantryman, was in Najaf with Alex. Alex was a team leader of Alpha Company, First Platoon, First Battalion of the Fourth Marines, and ever since that day when Alex was killed Smith always wanted to talk to Alex’s dad. Grilk contacted Melida Arredondo, Carlos’s wife, and they set up the call. “Alex was one of the best leaders I ever knew,” Dave Smith told Carlos Arredondo. Smith recalled a particularly grueling training session. He swam 800 meters to secure a beach, then climbed a steep cliff. He was shivering in the cold, soaking wet, having left his pack below to squeeze through a narrow passage. An hour later, Alex appeared with dry clothes from Smith’s pack. He had climbed down to retrieve the bag. “Next time, pack less crap, boot,” Alex said, winking. Dave Smith said Alex stood out because he was tough as they come, but kind to junior Marines and Iraqi civilians. His Marines loved him and followed him into battle. Carlos knew how his son died. He knows, and loves like a son, Mike Ayup, the Marine who cradled Alex after he was shot. Dave Smith was talking about how Alex Arredondo lived, taking care of the young Marines under his command, as he was the day he was killed. In Maryland last week, Smith handed the phone to Brandon Dodson, another Marine who was in Najaf. Ten years later, on his fifth deployment, Dodson stepped on an IED in Afghanistan and lost his legs. Smith was among those Marines who helped Dodson after he returned to the States. Dodson told Carlos they knew he had worked as a rodeo clown in his native Costa Rica, because Alex had told his Marines about his father. Six days before Christmas in 2011, Carlos’s other son, Brian, killed himself, as the last American troops were leaving Iraq. Brian never got over his brother’s death. Two years later, Carlos Arredondo suddenly was part of another family: survivors of the Marathon bombings. He is close to them, and to the families of those who died. Which is why Bill Campbell called him last week, to make sure Carlos was going to be there Sunday, when they broke ground in Medford for the park that will memorialize Campbell’s daughter Krystle, Lingzi Lu, Martin Richard, and Sean Collier. Carlos wouldn’t have missed it for the world. Carlos Arredondo was one of the great comforters in the wake of the Marathon attacks. But even comforters need to be comforted. Dave Smith and Brandon Dodson did that for him. With a simple phone call, they brought joy to a father who knows all sides of grief. Semper Fidelis means something to Marines, and to those who lost loved ones and limbs on Boylston Street. They are forever faithful, forever loyal.